Professional sales training programs can make the difference between an average year and a record setter. Steve Giglio’s professional sale training programs, tailored to your industry, business and style, get those results. Steve uses an approach that helps sales teams systematize the sales process. They will speak with a consistent voice, overcome challenges/resistance, increase their effectiveness and efficiency, and be seen as valued advisers rather than vendors. In short…your teams will close deals with more confidence. Steve Giglio is known as the gold standard for sales training in New York City and beyond. Whether in his home office in Manhattan or on the road at your location, Steve will deliver powerful training that grabs and holds your team’s attention. 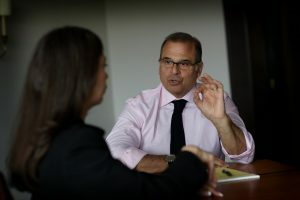 His Fortune 500 clients say that his ability to understand the complexities of their industries sets him apart from other professional sales trainers. Steve Giglio’s sales training programs focus on tailoring the sales message so that everyone is delivering the same key value propositions. Off-the-cuff presentations will be a thing of the past. Professional, well researched and focused, your team’s sales calls will result in more closed deals. Sales isn’t easy. You have to work at it and stay relevant to your clients. Every so often, some professional sales training programs designed to question the current process, find weaknesses and develop strategic approaches to achieve results are needed. Everyone wants to generate more sales. After working with Steve Giglio, your teams will discover more business opportunities with existing clients, establish new, strong client relationships and close deals more effectively. Your teams will work together more efficiently, establishing a selling system tailored to your business, your industry and your clients. Steve Giglio knows that confidence comes from comprehending a client’s business. To sell efficiently you must have a strong understanding both of the competitive landscape and the true benefits of your product/services. To win critical “trust” you must show the client that you “get” their business. Yet most sales professionals never take the time to gain that kind of insight. Steve Giglio provides them with a tailored, systematic approach so that confidence rises and sales come easier…and faster. Many people can sell, but far fewer can close. Securing new business is always a constant challenge while retaining and expanding existing business is even more difficult. Steve Giglio’s sales training programs ensure that your teams are constantly learning about your current clients, anticipating their needs and delivering solutions. After working with Steve, your sales people will be seen as trusted advisers with the ability to close deals more effectively. Steve’s sales training programs generate real results. To discover how he works, and the results he achieves, take a look at some sales training case studies.